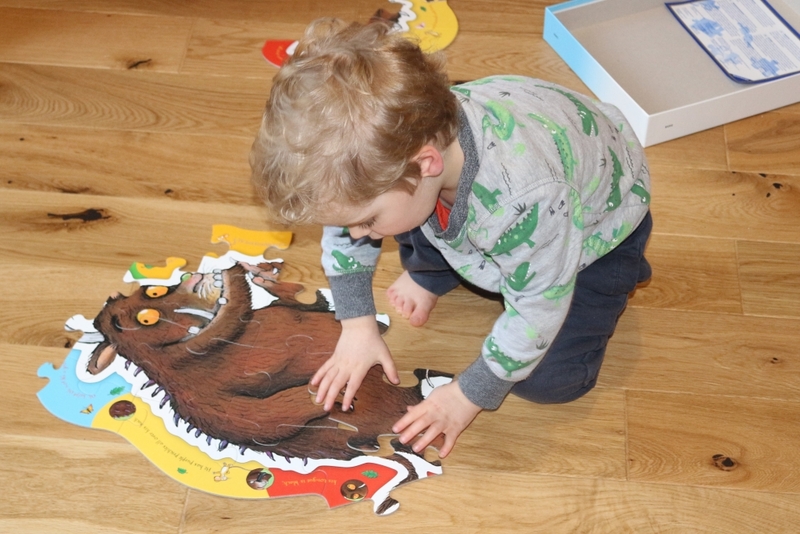 After my son absolutely loved the Paddington Giant jigsaw puzzle reviewed here and has made and re-made it every day since, we were really pleased that Ravensburger offered to send us a Gruffalo Giant 24-piece Floor Puzzle (age 3+) for review. 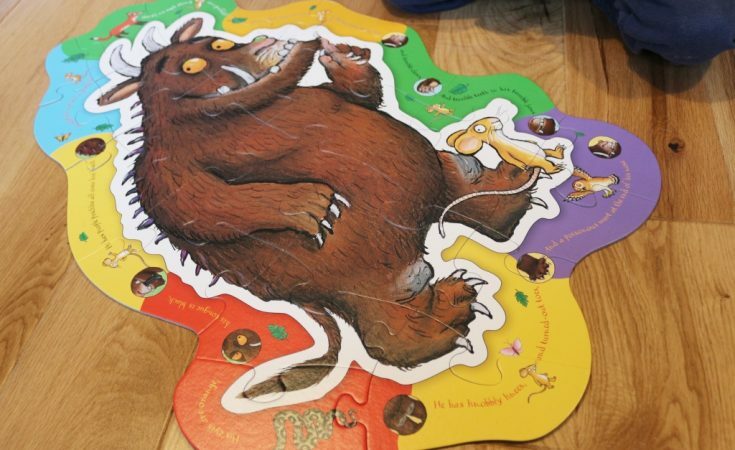 The Gruffalo Shaped Giant Floor Puzzle comes in a large box and is made of 24 very large puzzle pieces. The whole puzzle when completed is 26 inches x 17 inches at its widest parts. Small enough to fit on a dining table but better done on the floor! The puzzle is shaped like a Gruffalo, and therefore the pieces are all odd shapes too, which makes it a bit different from the other square jigsaw puzzles we have. The puzzle is aimed at children aged 3+, however my two year old completed it in under ten minutes so I’d personally recommend it for jigsaw fans over two. 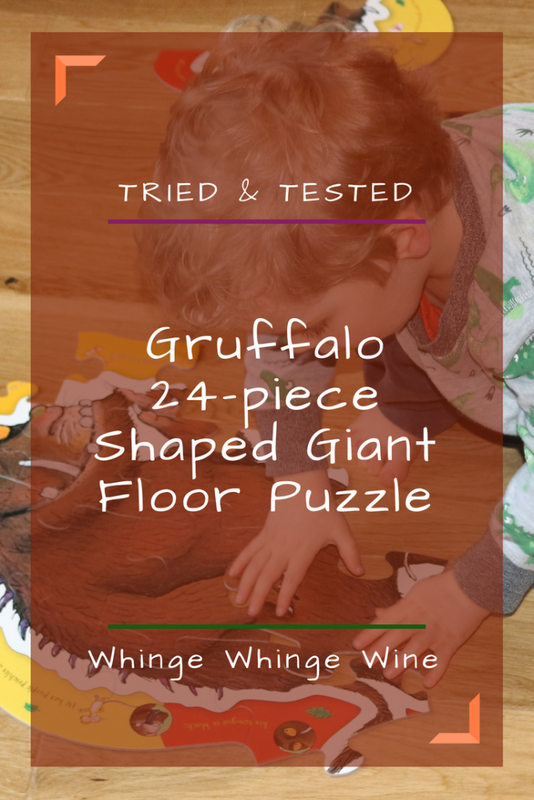 What we liked about the Ravensburger Gruffalo Shaped Giant Floor Puzzle. The Gruffalo is a much-loved and often requested story in this house, and we have a lot of Gruffalo toys and paraphernalia so this was an exciting addition! 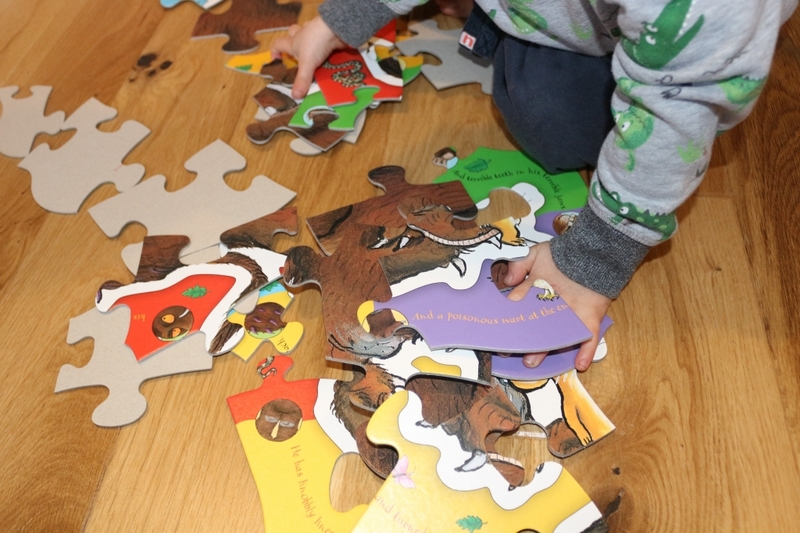 The jigsaw puzzle is in the shape of the Gruffalo with a colourful outline, containing sentences from the book as well as pictures of all the characters (mouse, fox, snake and owl). As my son loves ‘spotting’ and knows the characters well this was fun for him. The pieces are very larges and made of sturdy cardboard which won’t bend when forced into the wrong spaces. This jigsaw puzzle also came in a large box, big enough to take all the pieces without forcing them in. I am sure at some point in the near future we are going to run out of space for jigsaw boxes! He could take apart and put the jigsaw together again very quickly; from now on I will stick to 4+ jigsaws for him I think! However for a slightly younger child it would make a lovely activity. 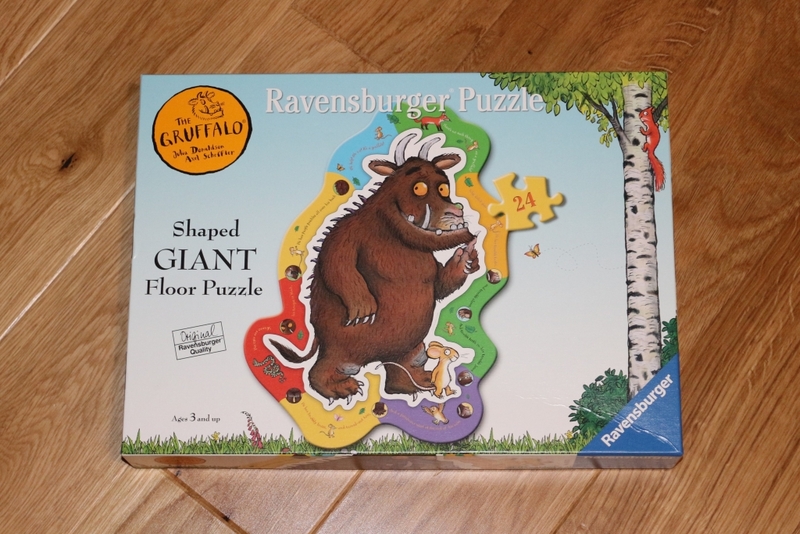 The Ravensburger Gruffalo Giant 24-piece Floor Puzzle has an RRP of £9.99 and can be bought from good toy shops or via Amazon using the affiliate link above. 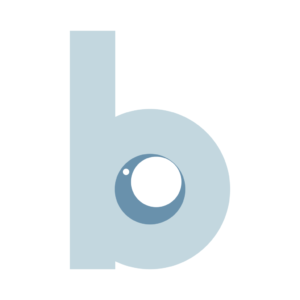 For more information, visit the Ravensburger website or follow them on Facebook or Twitter. 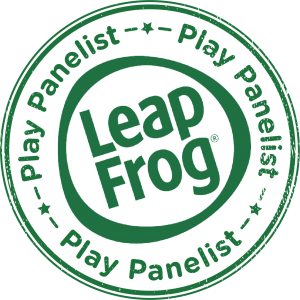 Why not check out our other Jigsaw Puzzle reviews? 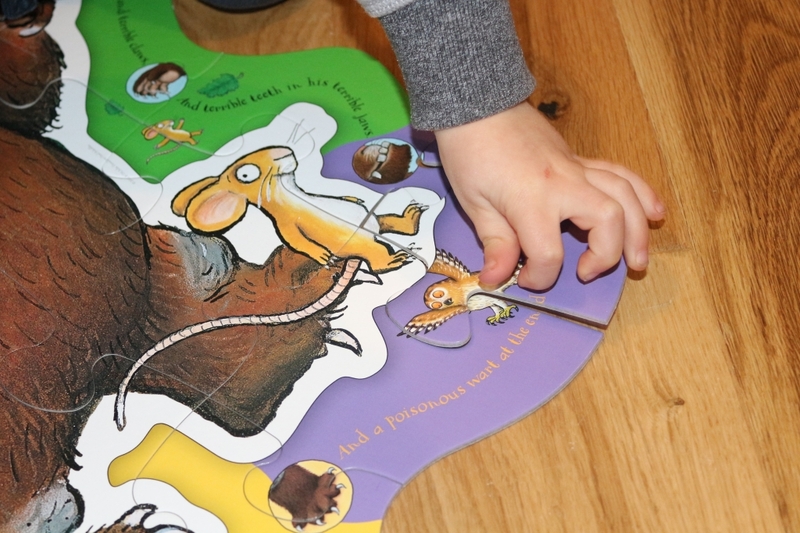 We were sent this Ravensburger Gruffalo Giant 24-piece Floor Puzzle by Ravensburger for free for the purposes of this review but all words and pictures are mine. Milestone cards for new mums - FREE printable!